When Milton Reed Ridley and his 5 sons opened the first Ridley’s Grocery and Meat Market. Even then, the Ridley boys took pride in delivering the highest quality meat. Today, four generations later, Ridley’s still strives after the same goal: providing the highest quality meat and the best service there is available. We no longer deliver by horse and wagon as the boys did in the ‘20’s, but we are making these quality meats available to anyone in the United States. With the advancements in technology, purchasing the finest meat is possible through the internet and express delivery services. Many things have changed since 1925 but not the tradition of excellence at Ridley’s Butcher Shop and service based on integrity and honesty. Only the finest premium quality meat is considered good enough to carry the Ridley name. We hope you will try our products and see the difference for yourself! Please give us a call and allow one of our experts to assist you in selecting the perfect cut of meat for the perfect occasion. Do you remember when you could walk into the corner butcher shop and have your meat hand cut by a genuine meat cutter? Do you remember the freshness and taste? Well, you can still get that quality at Ridley’s Butcher Shop and RidleysButcherShop.com! In today’s world of super-centers and wholesale warehouses we still pride ourselves in one on one service and superior quality products. Welcome to the home of the finest beef and pork products available today. The Ridley family not only offers the best meats available, but also backs it with over 75 years experience. We are located in southern Oklahoma, the center of beef country. Over several generations we have selected and offered the finest quality meat, proven in freshness, tenderness and overall taste. When you serve a meal with Ridley’s meats you can be assured it is of the highest quality. Whether it be a holiday or just a quiet evening at home, treat yourself to the finest meats available. The difference is in the taste! We start with over 60 years of experience in the ham business. Our ham is trimmed to the lean, the hock is cut off leaving a ham with less waste than the competition. 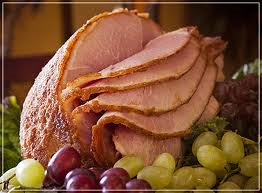 The ham is slow hickory smoked then spiral sliced around the bone for convenience. Then it is honey glazed with our special blend of spices and honey that seal in the natural juices and leaves a ham flavor that cannot be matched! Impress your guests at your next event!